Attraction marketing strategies helped me build a business online. It’s not about chasing after people and getting them to listen to what you have to say about your products. 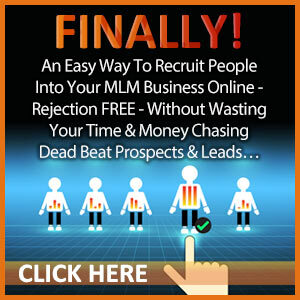 You can get unlimited MLM leads by having people chase you instead. That is what Attraction marketing is all about. I know that your sponsor told you to make a list of friends, family, and acquaintances, right? Then you are to either invite them somewhere or call them on the phone. You probably even have a script for what to say. There is nothing wrong with traditional network marketing methods and you should still do them. BUT… Attraction marketing is much more powerful. Let me explain. When I first started my business in 2009, I was working full time and doing volunteer work as well as other activities. I didn’t have a lot of time to actually go meet with people. So I decided to market online through blogging and video. People came to me. They were looking for information online and found me. Over 10,000 customers later, my business is still going strong thanks to attraction marketing. Can You Really Get Unlimited MLM Leads though Attraction Marketing? 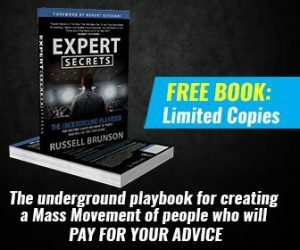 I have actually used attraction marketing for years and it really works. This marketing method is all about putting others first. What are the problems that challenge your audience? Solve those problems by providing value-driven content. Build a relationship through email, social media and phone contact. 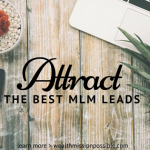 Keep in mind that the reason you can get unlimited MLM leads through attraction marketing is because people are coming to you. They already have an interest in your product, service or opportunity. Here’s another fact about using attraction marketing online. You can put yourself and your offer in front of an unlimited number of people. I have thousands of people read my blog or watch my videos. Why? They were searching for the information that I provided. 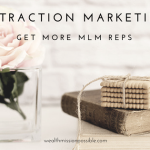 Top Earners Use Attraction Marketing too! What do all top earners have in common? They embrace attraction marketing. Have you dreamed of being a top earner in your company? 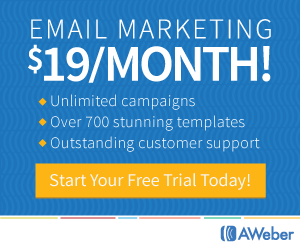 You should implement this marketing method in your business as well. By implementing an online marketing strategy, you can use the concept of attraction marketing to get in front of unlimited MLM leads. Whether you use blog content marketing, video marketing, social media, capture pages and so on, these are assets that work for you 24/7. These assets also give your audience a chance to know, like and trust you before they ever contact you. Think about how your network marketing business will change if you were using attraction marketing so the interested people can find you! Stop struggling. Follow the same attraction marketing steps that the top earners use to get unlimited MLM leads. CLICK here to watch a movie that explains. If you enjoyed this Attraction Marketing: The Secret To Unlimited MLM Leads, please feel free to share. Today is the day for attraction marketing. The old days of pounding the pavements is behind us, not that it doesn’t work but it sure isn’t using your time and efforts very effective. Thanks Ron! When I think about all the time I used to spend hunting down people to talk to, it makes me cringe a little. I found attraction marketing to be much more effective and a better use of my time. It’s also a better use of other people’s time. Great stuff! So true on attraction marketing being a better way. Closing rates also get so much higher when people are seeking you out versus the other way around. Thanks for sharing! Thanks Adam! I appreciate your comment about closing rates. The other way around makes it very challenging indeed!